R-Patz has been pictured surrounded by models at a party in the Hollywood Hills. Uh-oh. Robert Pattinson is one busy man. After being photographed here there and everywhere with a string of mystery women, the sultry Twilight actor has been picturing partying with pals again – this time joined by a group of Swedish models. Just hours after Katy Perry confirmed in an interview that the the pair were nothing more than friends, one of the blonde beauties took to Twitter to share photos she’d had taken with the star, while at the private birthday party of friend Greg Collard in LA. ‘Love my LA model family! 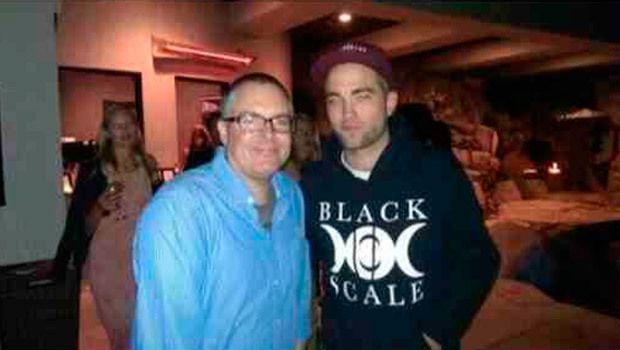 Hanging with team#edward#twillight#robertpattinson#topofthehollywoodhills#surpriseparty for our dear Greg Collard! We ❤ U,’ wrote Swedish beauty Maria Granburg. Earlier this week, Robert Pattinson was spotted leaving a Justin Timberlake gig with a mystery blonde. The notoriously private Twilight actor was photographed leaving the gig wearing a white t-shirt, black leather jacket and burgundy baseball cap, alongside the unknown lady, who is thought to be Aussie singer Sia. R-Patz also recently partied in LA with Fast & Furious actress Michelle Rodriguez, actor Simon Pegg, and artist/photographer Tasya van Ree, as well as posing back stage with Beyonce after a gig.